Egyptian Cotton has long staple on fibres which means that there is a lot more continuous fibre to use when creating threads. This thread can be made much smaller in diameter but is much stronger than other cottons. As it is a much smaller diameter thread there are more threads to the square inch, creating a stronger fibre but is much lighter in weight and has the advantage that it also breathes well. It there are more threads to the inch the thread count on the bedding label will be higher. The higher the thread count on Egyptian cotton means the fabric will be much stronger and hence will last for years and years. If cared for properly Egyptian cotton bed linen can not only last for decades, but every time the bed linen is laundered the Egyptian fibre cotton bedding becomes softer and softer. Initially sheets made with this cotton will feel a bit harder than normal cotton, but will become much softer after washing. 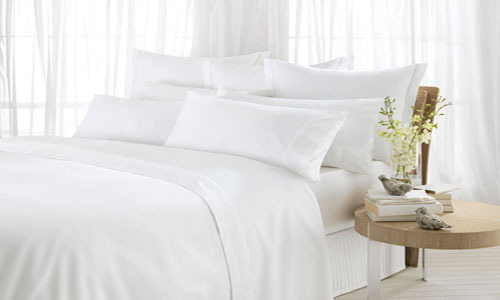 Because Egyptian cotton has the natural ability to breathe, it is able to work with your body temperature. This ensures that you will be kept warm and cosy in the winter but remain cool in the summer months giving you a perfect nights sleep what ever the time of year. When it comes to high quality and great value the Bed Butler Egyptian cotton range ticks all the boxes. This luxury duvet cover is closely woven percale ï¿½ with 400 threads per square inch ï¿½ providing a super soft, sumptuously smooth feel. Single H 200cm, W 135cm.